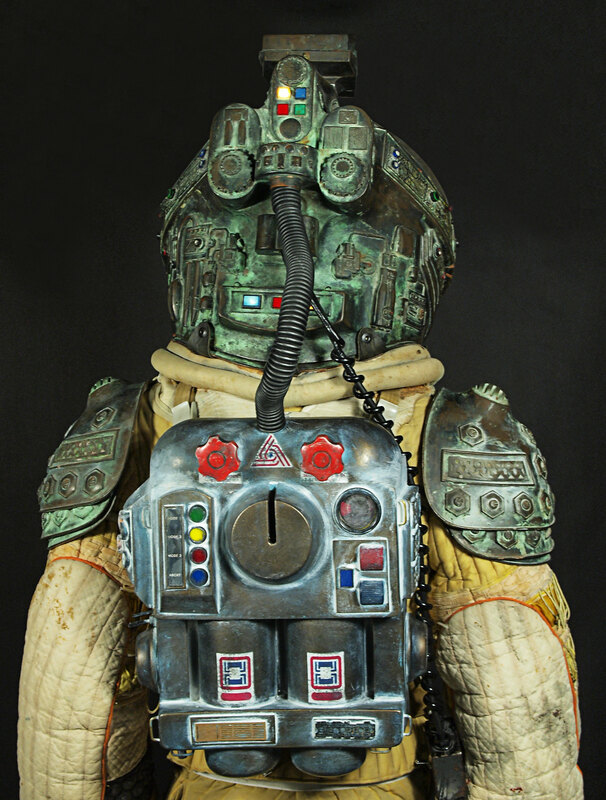 The jewel of the Prop Store Spacesuit collection is the iconic Kane Spacesuit from the 1979 science fiction horror film, Alien. The film spawned endless imitations and numerous sequels, and has rarely – if ever – been bettered. Directed by Ridley Scott, the film made an international star of the young and upcoming actress called Sigourney Weaver, and was the start of a film series legacy. However, the overall design of the movie is perhaps what is best remembered about it – from the incredible creature design by Swiss surrealist H. R. Giger, to the incredible set designs by Ron Cobb and iconic costumes by John Mollo (who also won an Oscar for his work on Star Wars). 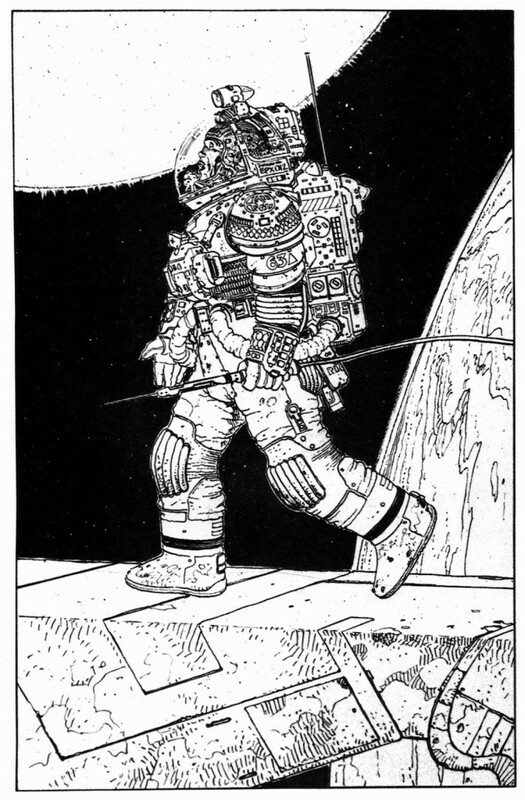 The initial design and inspiration for the spacesuit came from legendary French comic artist Moebius, who used a Japanese samurai style as his basis for the design. 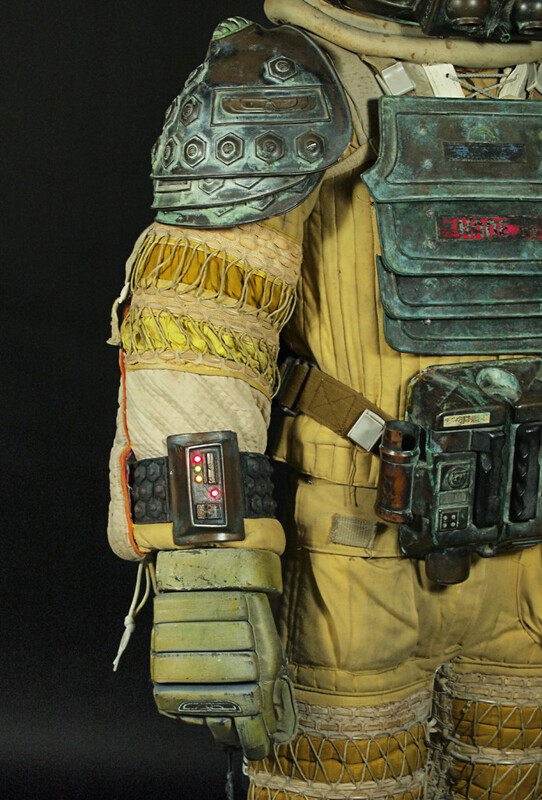 Moedbius brought the heavy, bulky look to the design – a look and style which he had already featured in his earlier comic book work – which then was taken on and brought to life by the film’s costume designer, John Mollo. The actors apparently hated the impractical design of the the costume because their movements were greatly restricted and the suits had no ventilation. 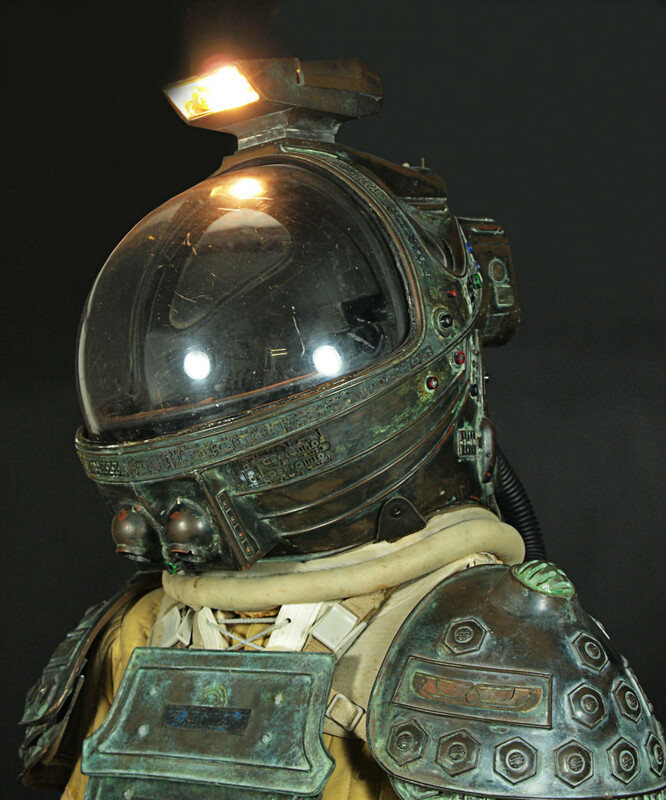 The Alien Spacesuit in the Prop Store collection was worn by John Hurt as Kane ( a character best know for the chestburster scene). The yellow markings of the costume are unique to his character, with Lambert’s (Veronica Cartwright) and Dallas’ (Tom Skerritt) suits appearing as blue and red. This suit is just one of just two full size outfits made for his character. This Kane suit matches to the one worn whilst Kane is walking through the “derelict”, and in amongst the facehugger eggs. 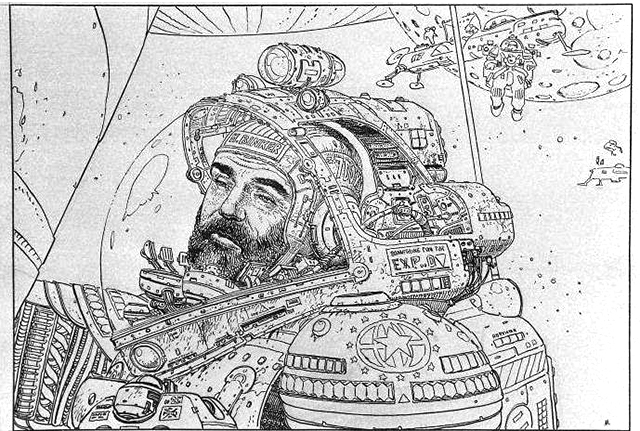 A different suit, with a slightly different configuration, can be seen hanging up in the ship later on in the film. 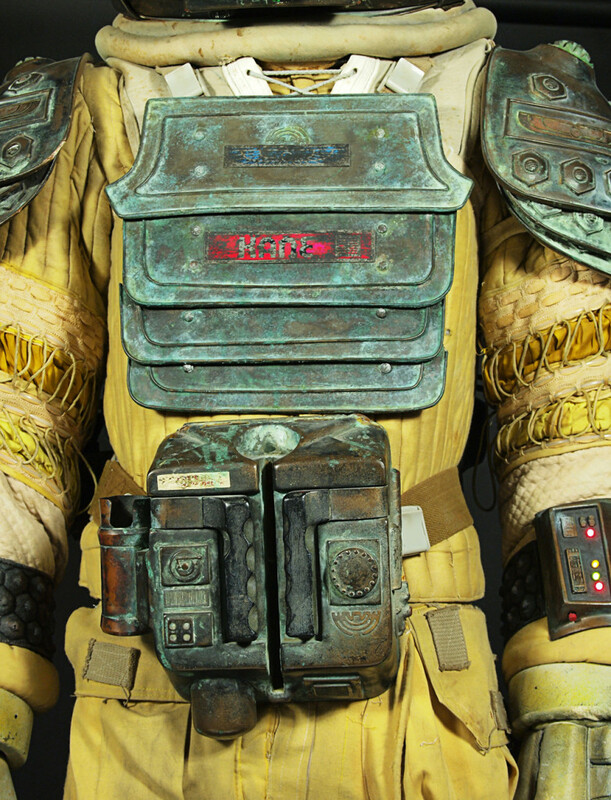 The costume remains in its original film used condition, with the exception of the back pack, the wrist guards and the “Kane” name badge on the chest, which have all been replaced with painstakingly accurate replicas, sourced from the original reference. The sheer impressiveness of the piece is in the detail. And, standing at over six and a half feet, it’s definitely something to behold, towering over our Spacesuit Collection in the London Office. If this tickled your fancy, and you love alien as much as we do, then make sure you check out our amazing collection of props and costumes from the Alien film series and see if you can find your very own piece of movie history! to seeking more of your excellent post. It looks like Big Daddy from Bioshock. I met such a person when I was at Vegas last year. I go there cause my friends gave me chip codes to try it. It was My first game so I didn’t pay much attention to the game. I liked it more because the city is equipped and how many cosplayers can be found. From this place got the biggest pleasure.